(Nanowerk News) Controlling the flow of electrons within circuits is how electronic devices work. This is achieved through the appropriate choice of materials. Metals allow electrons to flow freely and insulators prevent conduction. In general, the electrical properties of a material are determined when the material is fabricated and cannot be changed afterwards without changing the material. However, there are materials that can exhibit metal or insulator behaviour depending on their temperature. Being able switch their properties, these materials could lead to a new generation of electronic devices. One of the challenges in understanding why and how this switch occurs is due to a process called phase separation. The insulator-metal phase transition is similar to the ice to liquid transition in water. When ice melts, both liquid and solid water can coexist in separate regions. Similarly, in VO2, insulating and metallic regions of the material can be coexisting at the same time during the transition. But unlike water, where the different regions are often large enough to see with the naked eye, in VO2 this separation occurs on the nanoscale and it is thus challenging to observe. As a result, it has been hard to know if the true properties of each phase, or the mixture of both phases, are being measured. X-rays are a key tool for understanding the properties of materials, but it has been hard to use them to probe materials on the nanoscale because it is hard to build lenses for microscopes that can detect them. However, in a recent study published in Nano Letters ("Imaging Nanometer Phase Coexistence at Defects During the Insulator–Metal Phase Transformation in VO2 Thin Films by Resonant Soft X-ray Holography"), a team of researchers from ICFO and ALBA in Barcelona, the Technisch Universitat and Max-Born Institute in Berlin, and Vanderbilt University in Tennessee, has finally been able to probe the phase transitions that occur in thin films of VO2 using resonant soft X-ray holography. This technique is capable of imaging the electronic and structural changes in this material with an unprecedented resolution at the nanoscale without the need of a lens. 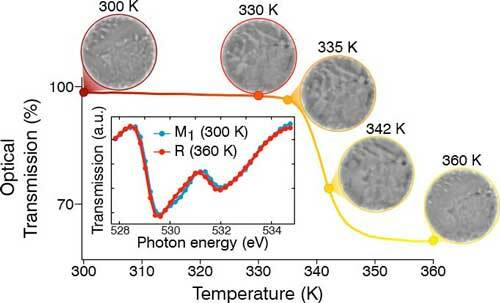 By looking at the material with 50 nm resolution, the scientists were able to observe that defects in the material played an important role in initiating the phase transition from the insulator to the metal. However, more importantly, the authors also observed a third intermediate state formed during the phase transformation. Whilst some regions transformed directly from the insulating to metallic phase, others transformed into a second different insulating state before becoming metallic at higher temperatures with the exact pathway taken depending on the defects present in the material. The coexistences of three phases has radically changed the views of previous studies that assumed the presence of only two states during the transition. Even more, the study presents new ways in which the transition could be controlled. In addition to the results obtained on the phase transition in VO2, the work also highlights the possibilities that X-ray holography can bring for studying materials on the nanoscale. The technique is the only method that can image real-time nanoscale dynamics and is now being used to study the properties of other intriguing materials such as high temperature superconductors.